(Ottawa) As premiers gather today at the annual Council of the Federation meeting, leading non-governmental groups from across the country are calling on provinces to clarify their support for the Kananaskis energy minister’s national energy plan. 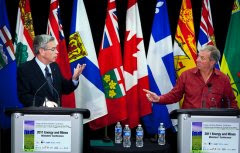 This plan included using a scenario for energy demand that would spur catastrophic levels of global warming as well as identifying the tar sands as a “sustainable” source of energy. Ontario refused to sign citing concerns about calling the tar sands sustainable and responsible and has called on the federal government to renew clean energy funding. The documents released yesterday used a scenario from the International Energy Agency (IEA) to argued that global demand for fossil fuels will continue to be strong, and thus that the expansion and export of oil from the tar sands must be central to Canada’s energy future. But this scenario is in fact the IEA’s worst case projection, known as “current policies,” which the agency predicts would lead to an increase in average global warming “in excess of” 6 degrees Celsius over the long term. Six degrees of global warming would take the planet far beyond the already dangerous two degree limit on global warming that Canada’s government, along with many provincial governments, has committed to avoiding. As the Council of the Federation meeting gets underway today, Ontario Premier Dalton McGuinty has called for renewed federal support for renewable energy and criticized subsidies to the oil and gas sector. Canada needs to aggressively end our addiction to fossil fuels and ramp up investments in safe, clean and reliable renewable energy in order to do our fair share to avoid dangerous climate change.